Bucket list item #33: Visit the lavender labyrinth. If you’ve ever fantasized about wandering down an endless, winding road of sweet-smelling flowers, a farm on Lake Michigan can help make your dreams come true. Cherry Point Farm and Market in Shelby, Michigan is home to a lot of fanciful (mostly edible) things, like cherries, pies, breads, jams, fudge, and even summer fish boils. The fruit and farm market has been in operation since 1961 and is currently run by the fourth generation of the founding family. 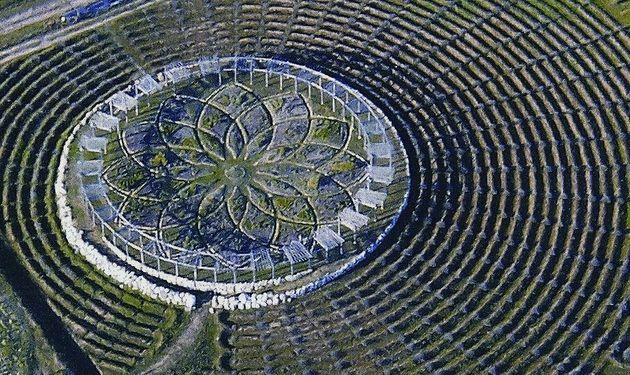 As if a homegrown roadside cherry shop wasn’t meditative enough, in 2001, owner Barbara Bull started work on a lavender labyrinth, which is now a popular attraction that’s large enough to be seen on Google Earth. While it might be way too late for the primary flower season—the labyrinth’s French lavender peaks in the springtime—it continues to bloom throughout the summer, and then dries up at the end of fall when it’s collected. The space is also home to other seasonal flora like apple, peach, and cherry trees—which are ready for harvest in the autumn—and all kinds of plants that are endemic to the area, like black-eyed Susans and wild hollyhocks. A journey into the labyrinth is free and doesn’t require reservations, so you can drop in and take a walk among the flowers anytime you like.